Cirque du Soleil, in its big blue and yellow tent, opened a five-week run at Lone Star Park in Grand Prairie. This time the circus presents the tale “Amaluna,” based on Shakespeare’s “The Tempest.” The show opened Jan. 23 and runs through March 3. “Amaluna” is the story of a magical island ruled by goddesses. Miranda, the daughter of the Queen and shaman Prospera, is a happy dreamer and a romantic young girl who is about to reach womanhood. Queen and shaman Prospera plays cello. The queen creates a big storm that brings a group of young men to the island. The leader, Prince Romeo and his men are trapped. The show evolves into a love story between Romeo and Miranda. The couple confronts challenges to be together, including dealing with the jealousy of Cali, Miranda’s half-lizard and half-human pet. “Amaluna” is unique for many reasons, one of which is the feminist element. The original soundtrack is performed by female musicians. With cello, bass, keyboard, drums and guitar, the music brings the tale to life. Created to enchant and amaze audiences, “Amaluna” gives spectators dozens of “wows” throughout the show. As with many other circuses, there are clowns. In this case, there are two: Papulya, Romeo’s manservant and Maïnha, Miranda’s childhood nurse. They entertain the audience throughout the show. The pair draws laughs as viewers follow the clowns’ own love story. They distract the audience as the stage is set up for the next scene. Cirque du Soleil performers seem to challenge gravity with their impressive acts. The show starts with artists flying above the audience on aerial straps. An breath-taking balancing act by the Balance Goddess with palm leaf ribs. Later, the Moon Goddess does a majestic act in a cerceau, or hoop. It’s incredible to watch the performers. Their moves are so smooth they give the audience the impression it is easy. Their skills go well beyond physical strength. 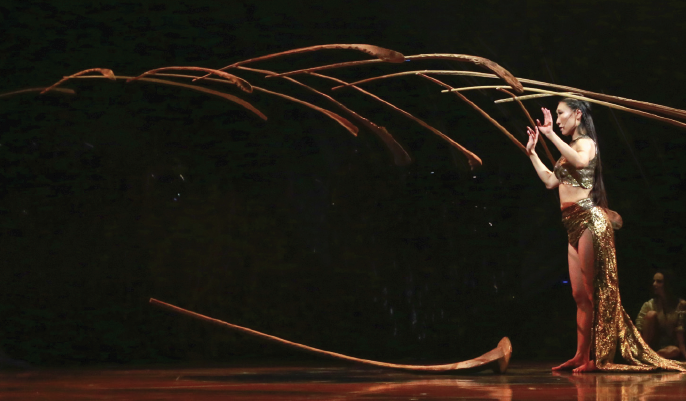 The suspense causes the audience to hold its breath while watching one of the goddesses as she balanced 13 palm leaf ribs. There is no music playing. The only sound is the heavy breathing of the artist as she concentrates. One of the most touching acts involves a scene between Miranda and her lover. Romeo watched Miranda enjoy herself in choreography that moved between playing in the water bowl and displaying her strength skills in a difficult hand-balancing routine. The artists also excel in their acting as the audience watches the couple share a first kiss. “Amaluna” combines the theatrical story with remarkable acrobatic acts. Watching the show likely gives viewers hope that dreams can come true. The spectacle is one of more than 23 shows by Cirque du Soleil. It debuted in 2012 and toured Canada, Europe, South America and the United States. The magic of the spectacle would not be complete without the music, lights, choreography, makeup and 130 beautiful costumes made up of some 1,000 different items. The circus travels via 85 shipping containers and trucks. “Amaluna” features 115 touring cast members, primarily women, from 22 countries including Brazil, Russia, Germany, South Africa, Ukraine and the United States. There is much more that can be said about this striking show, but some must be kept as a surprise for viewers. Don’t let the pricey tickets (starting at $56) scare you. “Amaluna” is an out-of-this-world experience that you will never forget. Maïnha and Papulya entertain the audience during stage changes. The half-lizard, half-human creation known as Cali is one of the main characters in Cirque du Soleil’s “Amaluna.” Cali is best friends with Miranda, daughter of Queen Prospera. Miranda views him as her pet, but Cali is secretly in love with Miranda. As he watches Miranda fall in love with the island visitor Romeo, Cali becomes jealous and tries his best to separate them. Cali opens the show playing with the audience while giving Maïnha a hard time. He appears throughout the show, but his special moment is his juggling act. Cali juggles seven balls and dances simultaneously with intricate movements that bend and twist his body to the amazement of the audience. “I am the one that actually makes the whole show turn around in the second act, but I can’t give away too much,” said Vladimir Pestov, who plays Cali. The juggler, dancer and actor is only 24 and he already has a long history with Cirque du Soleil. Originally from Russia, Pestov refers to himself as a “circus baby.” His parents were acrobats for Cirque du Soleil for 20 years and Pestov has been involved with the circus since he was very young. He studied at the National Circus School École Nationale de Cirque in Quebec, Canada. Pestov began his professional career with Cirque du Soleil at 17 in the show “Dralion.” He was also in the show “Varekai” that followed. He has now been with “Amaluna” for about three years. Moon Goddess and Miranda during the dance act in the water bowl. A late bloomer by conventional standards, Pestov began juggling at 12. He is self-taught and learned how to juggle by watching others. He practiced dance for six years in front of a mirror before taking his first dance class. When he received his first contract with Cirque du Soleil, he went to circus school and learned the proper techniques. Pestov jokes about the things he can juggle: eggs, knives, pennies, toothpicks, olives, grapes and oranges. “There are a lot of people who juggle better than me, but I combine movement and juggling at the same time, so that’s why it’s not very classical juggling,” he said. He believes that there’s no exact age to start juggling if you have passion for the craft.“If you want to start at 25 or if you are 40 and still want to juggle, there [are] a lot of different ways that you can get to the top,” he said. Before every show, Pestov prepares for two hours, fine-tuning his mind and body so he can excel onstage. He goes through a stringent routine of stretching, flexibility work and isolation dancing. Pestov does his own body and face makeup before every show. When he first joined “Amaluna,” it took him five hours to get into costume. Now it only takes about 40 minutes. Cali juggles balls during his act. “I am one of the really lucky ones that got to do what they like to do. And I didn’t have to go to a university to study it. I have this passion and I just went for it. But listening to other people – you kind of have this gratitude towards whatever life brings,” he added. Pestov said “Amaluna” is a one-of-a-kind show and that his character is intriguing to the audience. “You will see something that maybe you will never see before or never again in your life and maybe you will get inspired,” Pestov said.